I’ve demoed a LOT of mindmap programs and some are super simple to the point of being painful and others are super shiny to the point of being ghastly expensive. I’ll put linkages at the bottom of this. Currently, I have a subscription for Novamind (which I will cancel) and I have a paid version of SimpleMind (which I will keep). But what I am falling in love with and wish I could justify the cost of is TheBrain. So very, very shiny. I’ve cleaned up my Writing Brain and will share the link to it. The software syncs between the desktop, the app, and the web version. You can mark the entire brain as ‘private’ which means no one but you and whoever you choose has access to it. You can mark the entire brain as ‘public’ which means anyone with the URL can access it. And you can mark certain parts of the brain as private and other parts public. Which is what I have done with my Writing Brain. Long time no post! Life has been…intense. Anyway, I was doing something with OpenOffice, wanted to see if an extension would help, but the extension page wouldn’t load. And other information pages were showing years old stuff. Then I remembered someone on Facebook had said something about it being bought out or something. So I went investigating. And about cried. Apache OpenOffice was officially discontinued in 2011. OpenOffice has gone by a lot of names and transitions. It’s a good example of open source, licensing, proprietary, forking, and business politics. Kinda like a geek soap opera. Well, here, check out this image. At any rate, OpenOffice is, essentially, dead. Which is sad, because it had a HUGE amount of users. Huge. And was beginning to make MS Office sweat. 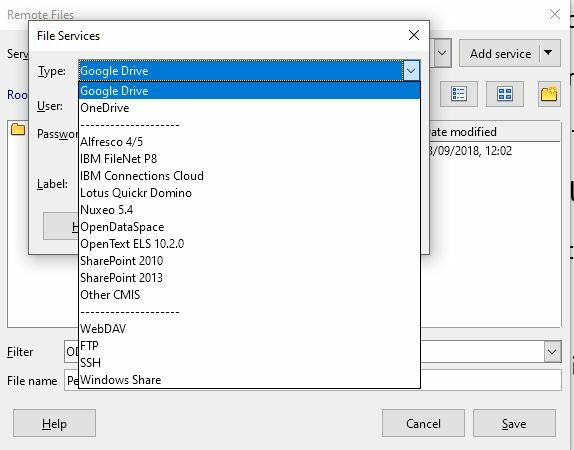 Which brings me to a replacement for those of us who hate MS Office (the bulk, the embedding, the cost, the crap, the seemingly constant file extension changes, and more!) and those of us who are uncomfortable using OpenOffice with no security updates forthcoming. 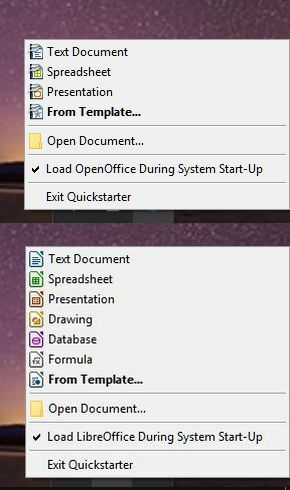 Enter LibreOffice (LO). LO has its own history (see the link to the image above) and could be (and should be) considered a better version of OpenOffice. LO is maintained by The Document Foundation (TDF) and is flourishing. Most of its programmers (and others) are from when Oracle donated OO to Apache Software. They didn’t like the direction it was going and left, got the source code (it’s all about the licensing when it comes to alleged open source), and made their own playground. Basically. Which means if you switch from OO to LO, there’s not going to be much of a learning curve since they are essentially the same. There’s subtle differences. I’ve been using LO for a while now (few weeks I guess) and am liking it. First off, I like the landing page. Because of it, I was able to remove a line of shortcuts from my desktop. I kept a shortcut for each manuscript I was actively working on so I could choose whichever one I felt like working on that day. But I can now open LO and see a pictorial representation of my recent documents. I can clear the list or just remove individual ones by clicking an X.
I never used the QuickStarter for OpenOffice because I’ve never had enough PC memory to handle it. LibreOffice takes a little longer to load a document but not so much I worry it has hung itself. I turned the QuickStarter on for both and checked the memory use. 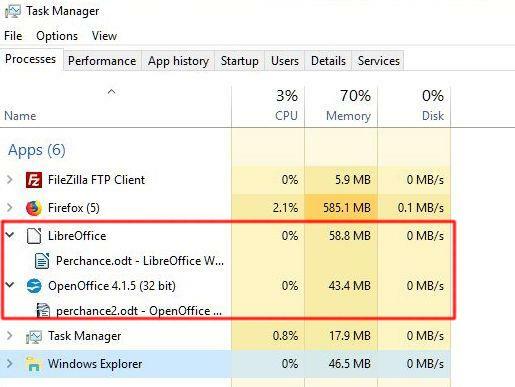 LibreOffice uses a lot more memory, even without the QuickStarter running. BUT, I also have more of it installed, as you can tell by the fourth image below. Both programs open with similar sized documents (odt format). Both programs with just the QuickStarter going. 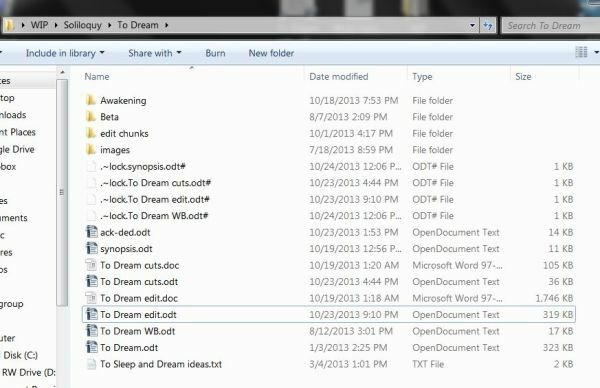 Both programs with similar sized documents and the QuickStarter going. There aren’t as many extensions for LibreOffice. But the good thing is it doesn’t need them. For example, in OpenOffice I had to put in a footer with the word count field, go to Tools>Word Count, or use an extension. LibreOffice has this standard AND shows the character count. And I heart it muchly. It’s the little things that make or break a relationship. I’m still exploring the extensions and will do another post about them later. Things are hard to find on the LibreOffice website. Like, when I first starting using it, I tried to use the Help. It wasn’t there and it sent me online, telling me I needed to download it. But it didn’t tell me where it was. And I couldn’t find it. I finally got frustrated with that and just started digging (it is kinda hidden in the box where you download it and is called “offline help”). It is a hard to navigate site. The Document Foundation (LO’s handler) does not offer support. You have to either pay for it or go to the extremely simplistic “forum”. I had an issue in the beginning that I had to go to the forum for help. I couldn’t use custom dictionaries. But I came up with the answer myself. There’s two things about LO that has me very happy. When you save a file, it saves a backup. I could never get OpenOffice to do it. Yes, that’s double the data but I can clean that folder out every once in a while, getting rid of saves I don’t need. The other thing it does is save to or open from a remote server. Meaning FTP/SSH, WebDAV, Windows Share, Google Drive, and/or a CMIS server. I love that. I can do a quick upload to my ftp site and access it from my phone or laptop. Now, if only it could save to other cloud services, too. 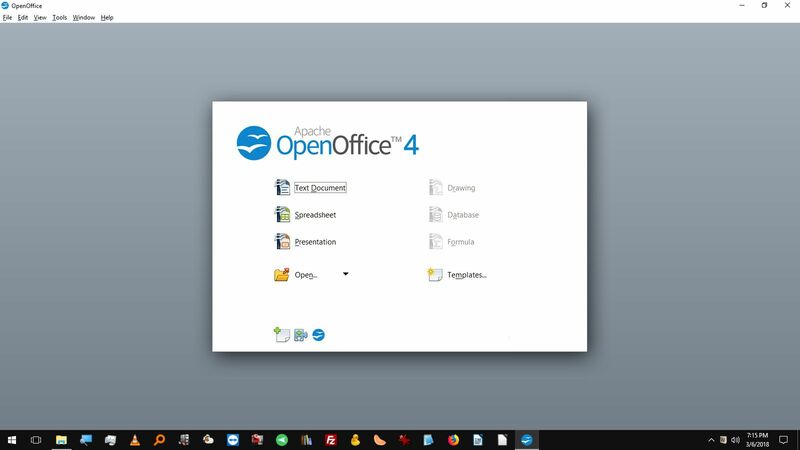 If you are using OpenOffice, consider switching to LibreOffice. 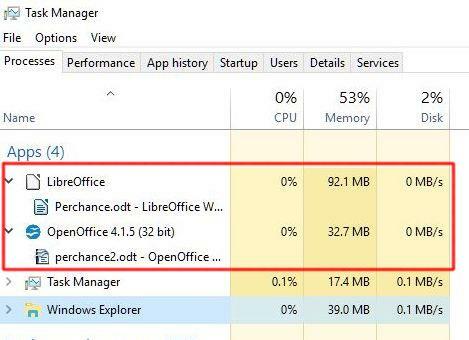 If you are using MS Office, consider switching to LibreOffice. I don’t like Cortana. Don’t want it. Didn’t ask for it. I find the entire thing not just a waste of resources on my already choked computer, but an invasion of my privacy. If you want to turn the dang thing off though, ha. Microsoft took care of the “off” switch a long time ago. And now even the registry change isn’t quite enough. (see how to do that here but know what you are doing!) There is one way to turn her off but it has to be done after nearly every major update it seems. It’s a simple matter of renaming a folder. 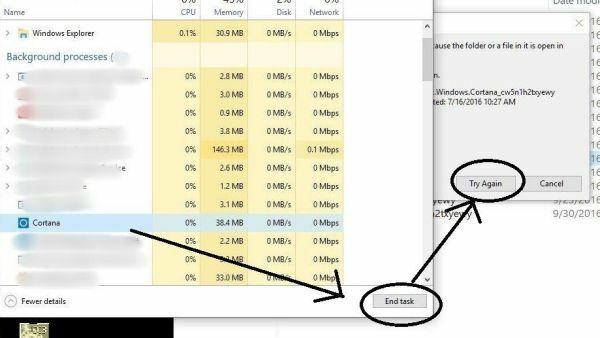 You will see “Cortana” running as a process in the Task Manager. Right click on the little darling and select “open file location”. This will take you to the folder you need to rename. Right click the name of the folder and select “Rename”. You want to simply add “.old” to the end of it. Change nothing else. Hit the Enter key. It will tell you the file is in use and do you want to try again. Leave this window alone. 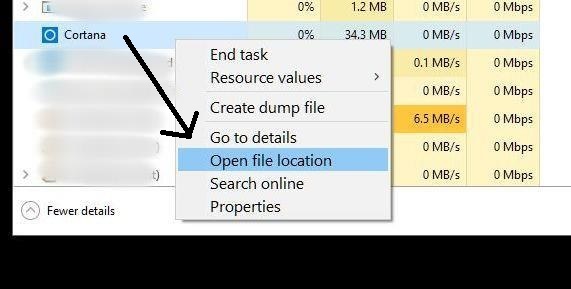 Go back to the Task Manager. Maneuver it so that it is near the “try again” window. Select the Cortana process and click the “end task”. Then quickly move the cursor over and click the “try again” button. If you were successful, you won’t see that window again. Cortana wants to live and she returns very quickly. If you see that window again, then just simply repeat the end task but be faster, grasshopper. Next time you see that dang Cortana process running, you’ll have to do it again. This will make the 3rd time I’ve had to do it. I’ve turned it off in the registry so I don’t know what the program is doing. And that is what i don’t like. So what mobile apps do y’all use to do your writing? Even research? And by mobile I mean not laptop or netbook, but tablet or phone. I use all Android on my Samsung Galaxy S3 phone (soon to be upgraded) and my Samsung Note 10.1 tablet. When I do write away from home and it is not on the laptop, it is on the tablet. With the Note’s pen, I can either do it by hand or use a keyboard (bluetooth or onscreen). I went with the Android because, as a writer, I wanted the ability to easily get to my files and keep backups on a card vs being forced to use a cable or cloud the iWhatever is limited to. My Note has a 32gb card that holds all my WiP files as well as my music, ebooks, and bunches of other stuff. My phone has a 64gb card because it has ALL of the music and a ton of other useless stuff. I keep the tablet more “professional” (less games, for one). If I like a program, I don’t hesitate to buy the pro or premium version. And if it is free, I like it, but the ads are annoying or I don’t like the permissions, I won’t use it. The two I use the absolute most are OfficeSuite Pro and AndFTP Pro. OfficeSuite Pro – word processing. Tracks changes that actually transfers to the desktop. Reads the .odt format (open document, which is what OpenOffice uses) but cannot save in it. 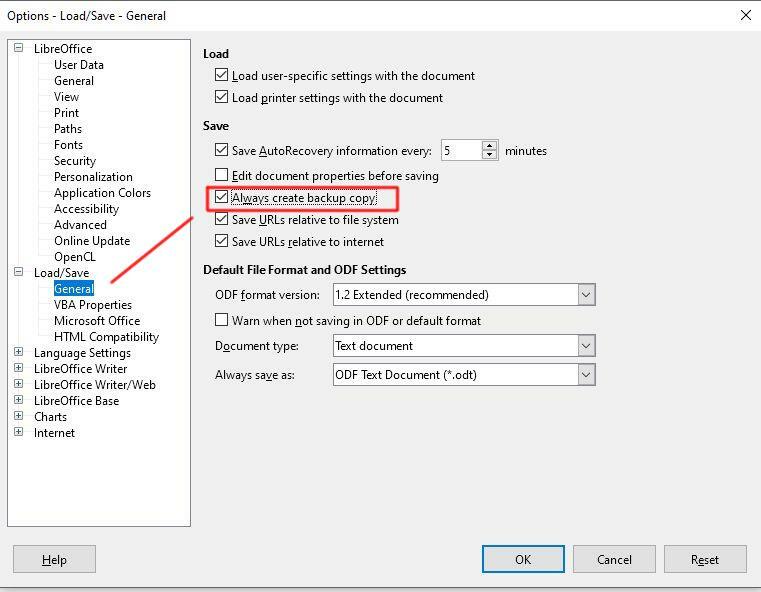 It can, however, edit that document then save in .doc which OpenOffice can then handle. Which is why I love OpenOffice. LectureNotes – I heart this muchly. You can import an image or pdf file then take notes on it or beside it. It is mostly for college students to use this way. You can also create your own drawings, notes, or whatever. There is a fully functioning trial version (has some limits, of course). Write: Tablet Journal – well organized note taking or journaling kind of app. I use this for world building and idea growing when away from home. I can export them in .txt format when I get home. Easier to manipulate the text than a simple note program yet not overly complicated. The notes can be organized into folders. There is also a version for phones. WordWeb – I use this on my desktop, too. Dictionary and thesaurus program that can also tap into Wikipedia and Wiktionary. Freakin’ way cool program. On the desktop, I use this a lot. Aldiko Premium – eBook reader. Reads epub, pdf, and acsm formats. I upload the books (including L’s Nook books) to my tablet via Calibre, a free ebook organization program. 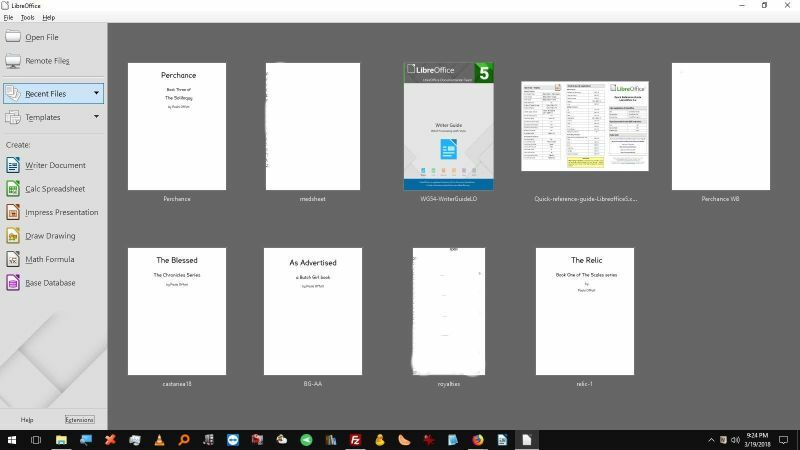 I just now found a Calibre Companion app which, somehow through wifi, works with your phone/tablet and Calibre on your desktop to keep your books organized. It won’t read them, but it can help you tag them, mark them as read, etc. I haven’t tried it yet but I will soon! SimpleMind – a mind mapping / brain storming program. I have it on the desktop, too. I prefer Novamind, however, but that program doesn’t have an app just yet so when I need it while away from home, I can explore the thought process with SimpleMind then transfer it when I get home. Rory’s Story Cubes – excellent and fun way to get a little spark back into your creativity! Hard to explain so you’ll have to check them out. They existed in “hard format” first and I think I would prefer them that way. BeyondPod – I was into podcasts for a while but then if I missed a day or week, I got behind and then it is hard to catch up and and and…so I don’t anymore. But I still have the app for if I ever want to get into it again. This was THE best app I tried (and I tried a lot of ’em) for finding the source, downloading, sorting, and then finding the download to listen to it. And finally, AndFTP Pro and S3Anywhere Pro. AndFTP is an ftp app that lets me upload/download to/from my backup ftp site. I do regular backups and syncs (yes, I do both) from my desktop and when actively writing, I do daily syncs of the active project. That way, when away from home, I can access the most recent version from my tablet, even if I haven’t put it on there. S3Anywhere allows me to access the cloud service I use (I use DreamHost’s DreamObjects). I don’t often use it but in case something happens to the FTP version, I still have the cloud version. And ya never know! The two apps are made by the same company. There’s a few more that I tap for reference but these are the faves. 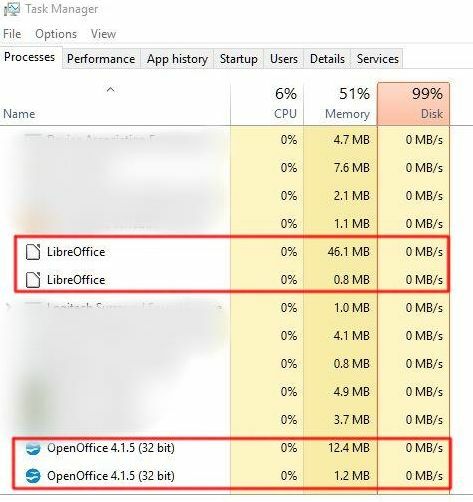 OfficeSuite and the ftp one are used the most. I’ve tried a LOT of different apps over the past, what, two years? I really liked Kingsoft, which became WPS Office but it couldn’t handle the odt format. Remembering to save in doc and to upload it was a pain in the arse. It had some other issues as well (clearing the “most recent” list had a tendency to delete the files themselves!) and I was pleased to find another app.